Marigolds add bright, cheery color to flower beds and pots with their multi-petaled orange and yellow blooms. Sow these low-maintenance annuals in the garden after the last frost has passed or purchase inexpensive nursery plants. Marigolds bloom the whole summer and into fall, making them a good choice among short blooming perennials. Marigolds are seldom used in floral arrangements, probably because of their pungent odor. The Portuguese discovered marigolds in Central America, probably Mexico, in the 16th century and introduced the sub-tropical flower to Europe and Asia. Marigolds are heavily cultivated in India and Pakistan for medicinal, dye-making and ceremonial uses. Indians give marigold garlands to honored guests, using them in religious ceremonies, funerals and weddings. During the festival of Holi, people soak marigolds overnight in boiling water to make the yellow water sprinkled on others during the celebration. Plant marigolds in late spring, after all danger of frost has passed. In USDA hardiness zones 5-3, plant around May 15. In zones 6-10, marigolds may grow almost year round. Plant seeds 1/4 inch deep and 3 inches apart in loose, well-drained soil and keep the soil evenly moist. The plants will sprout in five to 10 days. Marigolds need 45 to 50 days from planting to bloom, so consider purchasing nursery plants or start the seeds indoors four to six weeks before the last estimated frost. Marigolds grow rapidly and have few problems. 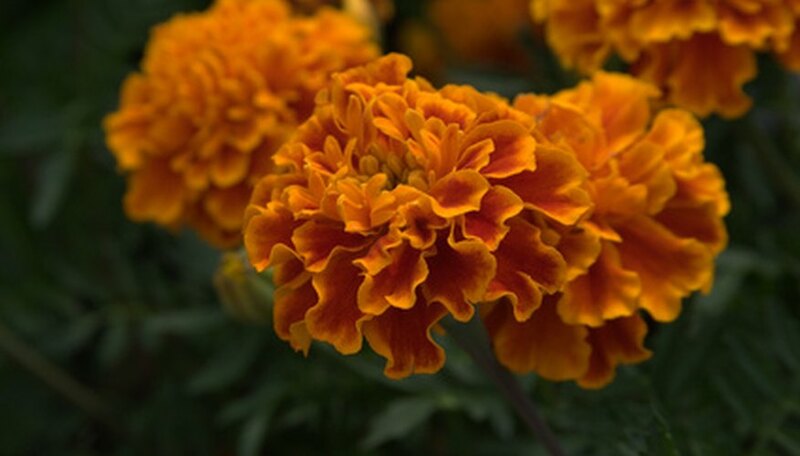 Plant marigolds in full sun and cover them with a row cover or cloche during chilly weather. While fairly drought-tolerant, they'll bloom more profusely if the soil is kept evenly moist. They don't tolerate saturated soil. Remove spent flowers for more profuse blooming. Marigolds will self-seed and may come back year after year if you allow the flowers to go to seed. African marigolds (Tagetes erecta) come in two varieties: large-flowered and tall. Large-flowered African marigolds grow to 14 inches tall with flowers that are 3 to 4 inches across. The flowers are doubles and range in color from yellow to orange. Tall African marigolds are used mostly for cutting and reach a height of 3 feet or more. They must be staked to prevent breakage. 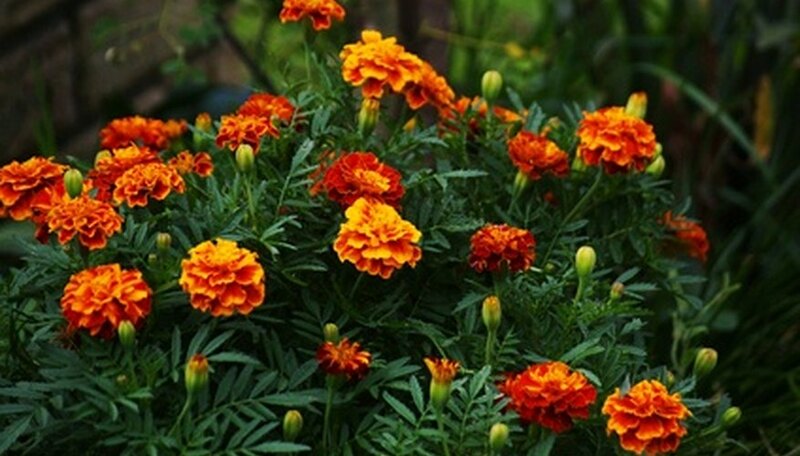 French marigolds (Tagetes patula) are more commonly grown. These small plants grow to about 12 inches tall with smaller flowers. They come in a variety of colors including yellow, orange, mahogany and even cream. They sometimes peter out during hot summer days. A mid-summer planting will provide fall blooms. Marigolds have long been appreciated for their ability to repel garden pests. Recently, a University of California study found that French marigolds significantly reduced nematode populations in the soil. Plant marigolds in rows for maximum benefits around vegetable gardens, especially close to bug-prone crops like cabbage and broccoli.